Some time ago, I announced the topic of my bachelor paper and gave a short introduction about it. You thought I had forgotten all about it? Hah! In fact, I have written several (Dutch) texts about it this far and finished my paper. So, now the deadlines are gone it’s time for an update. First: wrapping in its literal meaning. Japanese history is filled with various types of wrapping. Archeologists dug up remainders of early wrapping methods, other types of packing are described in ancient books. Ever since the Jōmon Period (10.000 B.C. – 300 B.C.) people used the peel of melons and gourds and the skin of animals to transport water and food. They wove bamboo leafs, rice plants and wooden splints to cover things. And of course Jōmon pottery was used for storing food. The Jōmon people formed a nomadic hunter-gatherer society and because of their constant moving, wrapping materials were necessary for bringing their belongings with them. During the Yayoi Period (300 B.C. – 250 A.D.) not only various material wrappings were invented, spatial wrapping was put into practice as well. Yayoi people lived in specific houses, called tateana 竪穴 or “pit houses”. Another example of spatial wrapping is the way the dead were buried. Two big jars enclosed the body. These jars were put horizontally under the ground. During the Kofun Period (3th Century – 7th Century) textile was preferred because of its light and flexible quality. Weaving techniques were imported from China, together with sericulture. The Nara Period (710-794) was short but covered a whole range of new wrapping materials, due to a strong development of culture and economics. Wrappers for silk clothes, tableware, ritual wrappings, lunch-boxes… Many objects were brought back from Tang China and definitely introduced in Japan. One of the most well-known wrappings, furoshiki 風呂敷, can be traced back to the Heian Period (794-1185). Furoshiki is a creatively died, eco-friendly, multifunctional wrapping cloth. Originally, it was used to put away clothes and personal stuff before the owner entered a public bath (the characters means “bath spread”). Nowadays, furoshiki are a popular wrapping for lunch-boxes and presents. Depending on the object you want to wrap, there are many ways of folding furoshiki. A folded wrapping cloth (furoshiki) next to its own wrappings. But I think of sacred cords of another autumn. Here Genji suggests a religious retreat because he has been rejected by Princess Asagao “Morning Glory”, a high priestess who is the receiver of this letter. The sacred branch with ritual cords matches the contents of the letter, and is at the same time an homage to the high priestess. Decorated letters survived the ages. 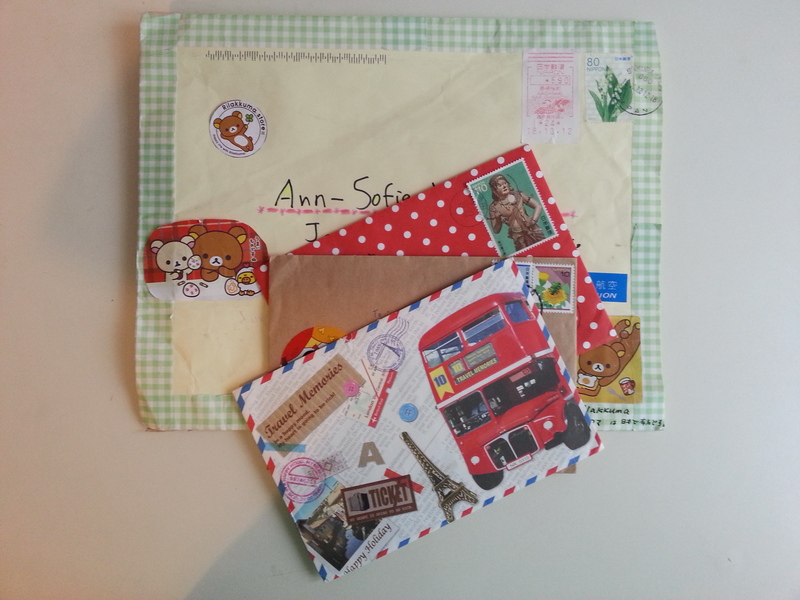 Some letters from my collection I received from Japanese pen friends. During the Japanese Middle Ages (1185-1603), again, many new wrappings came into vogue. Among other things the tradition of noshi 熨斗 as a ritual wrapping for gifts was initiated. Noshi is a small piece of abalone, covered in white and red paper. Abalone itself was originally a gift, but was later used as a symbol of a gift. It symbolizes the purity of the giver. Dirtiness in shintoism is associated with death and illness. Nowadays, noshi is printed or reproduced on an envelope, the ensemble called noshigami 熨斗紙. Often money is presented this way. Noshigami with a noshi in the right corner. The gold and silver knot strings (sometimes red and white), mizuhiki 水引, dates back from the Edo Period (1603-1868). The knot symbolizes the unity between giver and receiver. Another item that became used as a wrapping for gifts is fukusa 袱紗, or tea cloth. Its original function was purifying equipment used during the tea ceremony. In an isolated Japan, native traditions were strongly kept alive. 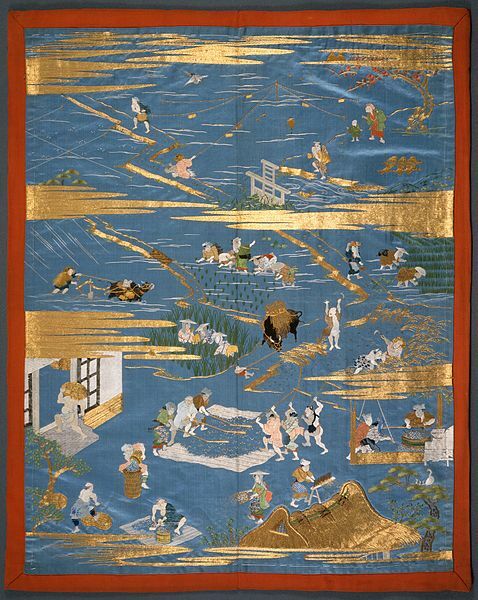 Every wealthy family possessed some fukusa, richly embroidered with gold thread and depicting abundant scenes, along with the family crest. It was representative for the owner’s taste and wealth. Just like furoshiki, the wrapping was usually returned after presenting the gift, unless the receiver was much higher in ranking. 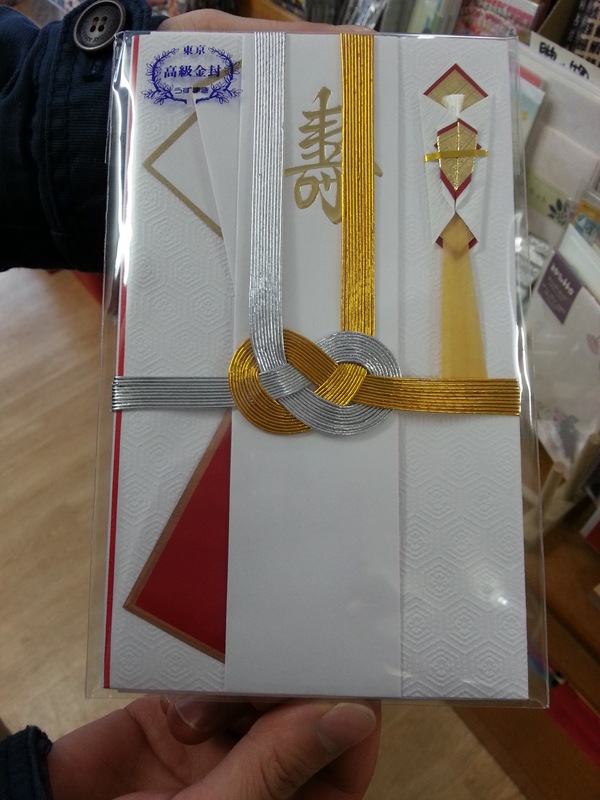 Nowadays, fukusa are rarely used as a gift wrapping, except for weddings maybe. 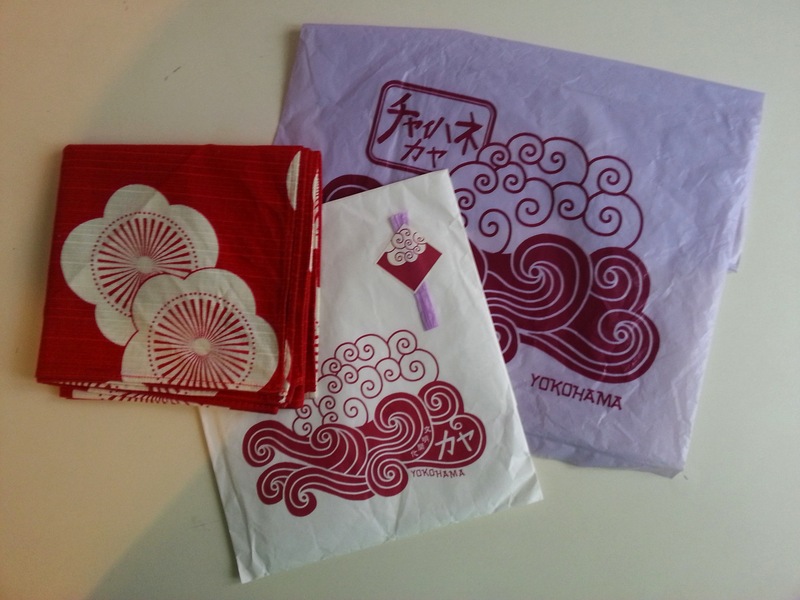 Nowadays, furoshiki and noshi are two traditional wrappings that are still used daily. But above all, the most popular wrapping today is without doubt the plastic bag. And Japan knows how to use it very well. You can’t leave the super market without your purchases being wrapped separately and again in a bigger bag. Good news is that Japan is a front-runner in the recycling of plastics (77% in 2011). 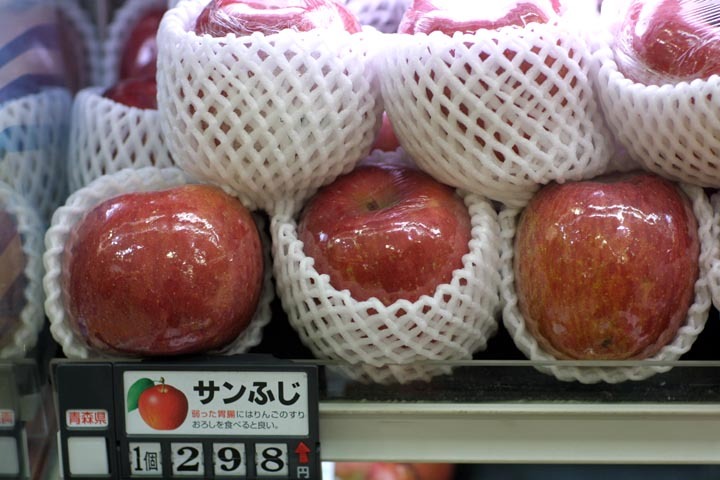 Fruit is wrapped in plastic and again in a silicon cover. All the presents I have received up till now were covered in at least two layers of wrappings. Sweets for example. These sweets are mostly distributed as small presents (omiyage お土産) to friends. The sweets I received were wrapped in paper, in a plastic box with a cellophane cover, and provided with a wrapped fork and a little “oxy-eater” bag. A good thing is that recently the eco-friendly furoshiki is totally in again. A type of mochi, rice cake. – Hendry, Joy. Wrapping Culture: Politeness, Presentation, and Power in Japan and Other Societies. Oxford University Press, 1995. -Fukuzawa, Kotoe, Akira Ueda, Chan-­‐il Park, Kiyoshi Miyazaki, en Takayuki Higuchi. 『飛鳥から平安時代におけ る「包み」の文化 ー「風呂敷」の語源とその前史.』 (asuka kara heianjidai ni okeru “tsutsumi” no bunka -­‐“furoshiki” no gogen to sono zenshi, Eng: Origin and Transition of “Furoshiki” Investigated from Materials in Asuka, Heian and Nara periods – Prehistory and Etymology of “Furoshiki”) Bulletin of JSSD 54, no. 4 (mei 2007). -“Japan Streets Ahead in Global Plastic Recycling Race.” The Guardian, 29 december 2011. http://www.guardian.co.uk/environment/2011/dec/29/japan-­‐leads-­‐field-­‐plastic-­‐recycling. -Nukada, Iwao. 包み (Tsutsumi, Eng: Wrapping). Tokio: Hōsei Daigaku Shuppansha, 1977. -『年表でみるモノの歴史事典』. (nenpyō de miru mono no rekishijiten, Eng: historical encyclopedia of things, seen in chronological tables) Tokio: Yumani Shobō, 1995. -Vande Walle, Willy. Een Geschiedenis Van Japan: Van Samurai Tot Soft Power. Leuven; Den Haag: Acco, 2009. -Rupp, Katherine. Gift-­‐giving in Japan : Cash, Connections, Cosmologies. Stanford, Calif.: Stanford University Press, 2003. -Joya, Moku. Japan and Things Japanese. Londen: Kegan Paul, 2006. -Murasaki Shikibu. Genji Monogatari. Rutland, Vt.: C.E. Tuttle, 1974. This entry was posted in history, Uncategorized and tagged culture, furoshiki, japan, wrapping by Nippaku. Bookmark the permalink.